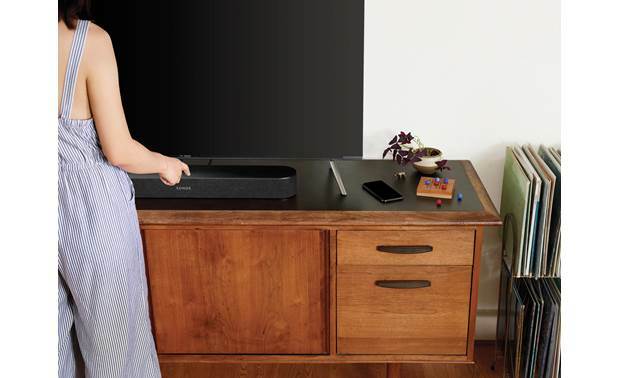 The compact Beam is Sonos's most advanced TV sound bar to date. 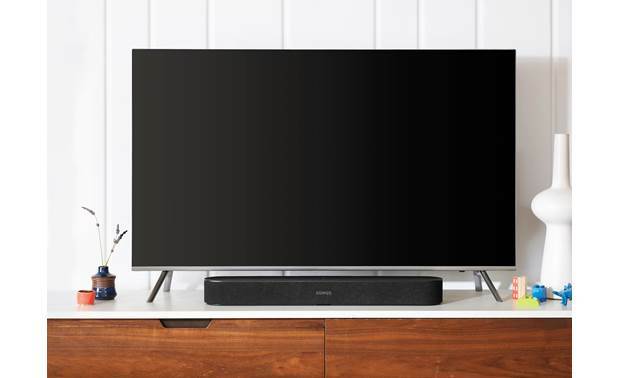 The compact Beam is Sonos's most advanced TV sound bar to date. It's great for music, delivering spacious, detailed, stereo sound. 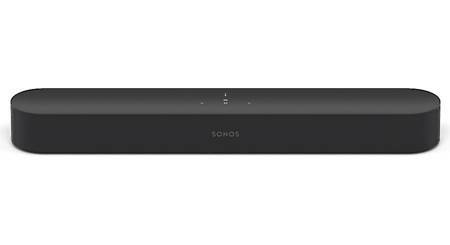 And it can be part of a Sonos wireless multi-room audio system. Plus, the Beam has Amazon Alexa built-in. So you can operate the sound bar, other Sonos speakers, and all your Alexa-compatible devices just by talking to the Beam. Add the optional wireless Sonos Sub for deep bass. 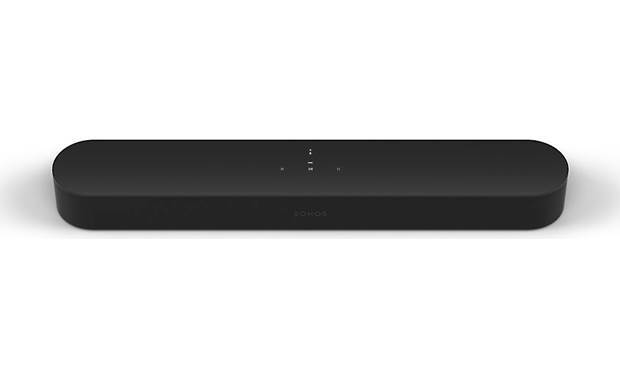 The Beam can be paired wirelessly with a Sonos Sub to create a 3.1 home theater system. 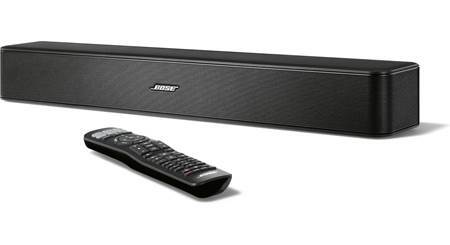 Add a pair of Play:1 speakers as wireless surrounds, and you've got a full 5.1 system for wraparound sound. The Beam connects to your TV's HDMI ARC (Audio Return Channel) port with an included cable. If your TV doesn't have this kind of HDMI connection, Sonos has included an adapter cable for connecting to your television's optical digital output. Either way, you can send sound from your connected TV to other Sonos speakers all around your house. 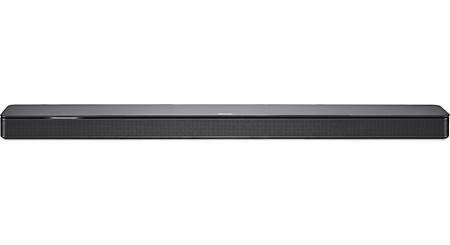 Your Beam can be part of a larger multi-room audio system. Place Sonos players like the Sonos One, Play:1, or the larger Play:3 or Play:5, in every room where you want to listen to music. You can set up the players to work on your existing Wi-Fi® network. Or, you can connect any Sonos speaker to your network router, and Sonos will create its own dedicated wireless network for even better performance. You can also use a Boost to create this network if you can't place a speaker near your router. If you use your Sonos control app on an iPhone®, iPad®, or iPod touch®, you can use it to fine-tune the Sonos Beam with Sonos's Trueplay feature. It uses the mic built into your device to measure how the sound reflects off your walls and furnishings, and then it adjusts the speaker's settings for the best possible sound. Sounds great and easy to install with other sonos speakers. 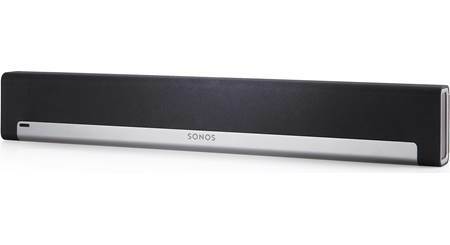 Multi-Speaker Array: The Sonos Beam houses utilizes a multi-speaker array to harmonize low and high frequencies. The Beam houses one tweeter for crisp and clear dialog, four full-range woofers for faithful midrange and rich midbass, plus three passive radiators for deep and accurate bass. Class-D Amplification: Five Class-D digital amplifiers are perfectly tuned to match the Beam's single tweeter, four full-range range woofers, and the acoustic architecture of the passive radiator enclosure. Thanks to discrete Class-D amplifier technology, you get clear and dynamic sound at any volume level without distortion. Trueplay Tuning (for Apple iOS): The layout of a room, and where a speaker is placed, can have a significant impact on the sound that you hear. Trueplay, an auto-tune app within the Sonos App, uses the microphone in your Apple iOS 8.0+ device to measure how sound reflects off walls, furnishings and other surfaces in a room, and then fine tunes the Sonos Beam soundbar speaker to make sure it sounds great no matter where you've placed it. 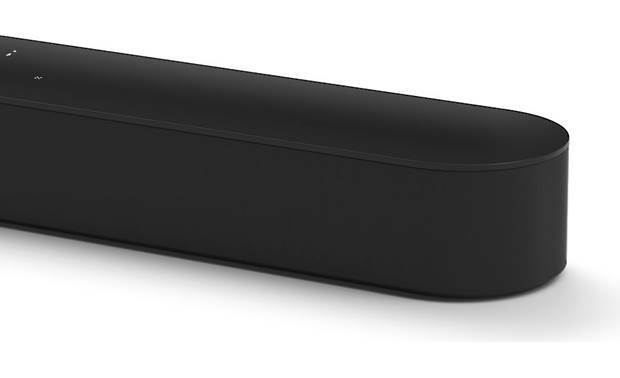 The Sonos Beam speaker already sounds fantastic, but Trueplay brings you even closer to how music should sound. Completing Trueplay tuning for a room takes approximately 3 minutes from start to finish. Note: Trueplay is currently not compatible with Android devices. 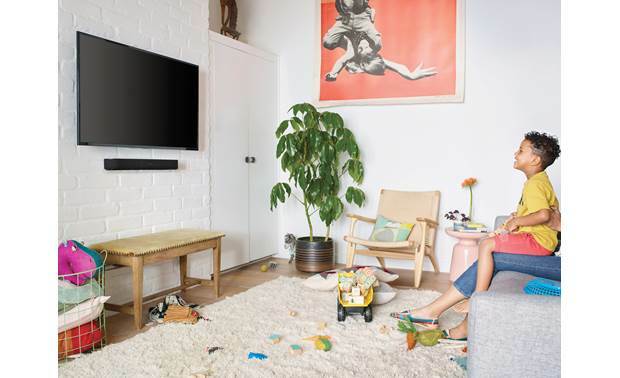 Sonos Multiroom Eco-System: The Beam is part of the Sonos wireless multiroom music eco-system consisting of a family of wireless network speakers, players, and amplifiers. 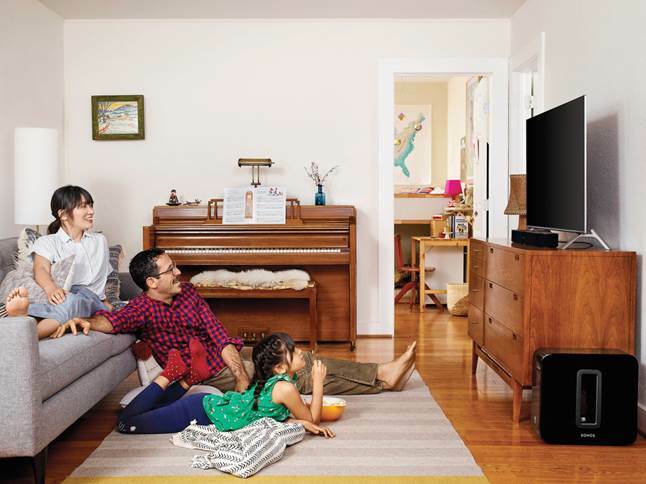 Start with the Beam soundbar speaker and add other Sonos products - including the Sonos Play:1 / Play:3 / Play:5 powered speakers, the Sonos One voice-activated speaker, and the Sonos Connect:Amp / Connect zone players (all sold separately). With multiple zones, you can play the same or different songs in different rooms of your home. Up to 32 Sonos devices can be connected in one system. Ethernet Port (10/100 Mbps): In addition to built-in WiFi, the Sonos Beam is equipped with one Ethernet port (10/100 Mbps). Use it to wire directly to your router to operate Sonos if WiFi is unstable, or use the Ethernet port to provide Internet accessibility to non-wireless devices if you're using a SonosNET Boost setup. 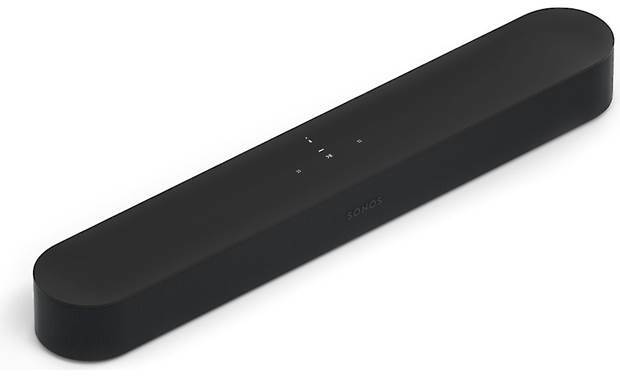 Note: Even though the Play:1, Play:3, Playbar, and other Sonos products are not AirPlay 2 compatible, you can still group these Sonos speakers with an AirPlay 2 compatible player (like the Sonos One, Play:5, or Beam) to unlock AirPlay for your entire system. Automatic Updates: The Sonos Beam supports free automatic software updates so you will always have the newest features and music services to enjoy. Simply register the Beam and Sonos will automatically notify you when software updates are available through Sonos Controller app. By simply pressing one button your system updates itself. Built-in Microphones with Alexa Skills: The Sonos Beam blends great sound and multiroom audio with Amazon Alexa for voice-activated, hands-free control of your music and more. Five far-field microphones with advanced beamforming and multichannel echo-cancellation are built in to Sonos Beam to detect your voice from any direction, anywhere in the room. When the microphone LED is on, Alexa is ready for a voice command (these microphone can be turned off). You can speak at natural volume to activate Alexa-supported voice commands. Based on your preference, you can choose to have voice feedback turned on or off. You'll be able to control music and multiroom playback with just your voice. You can also use the Sonos Beam like any other Alexa Echo device and ask Alexa non-music related commands (like information about the weather, traffic, news, sports, etc) or have Alexa control your smart home devices. For a complete list of Alexa voice commands you can use with Sonos, click here. Music Control: Use your voice to play music, group rooms, and turn up the volume. 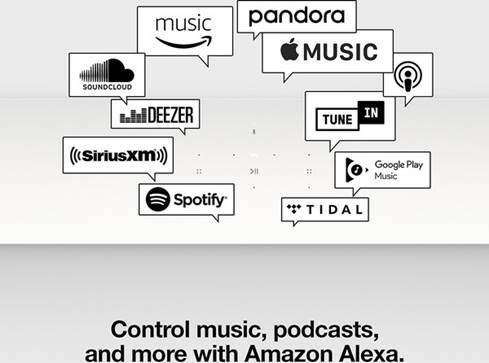 You can ask Alexa to play music from these featured music services (Apple Music, Amazon Music, TuneIn, Pandora, iHeartRadio, SiriusXM, & Spotify). You can pause, resume, and skip songs, as well as change the volume with all Sonos compatible online music services. 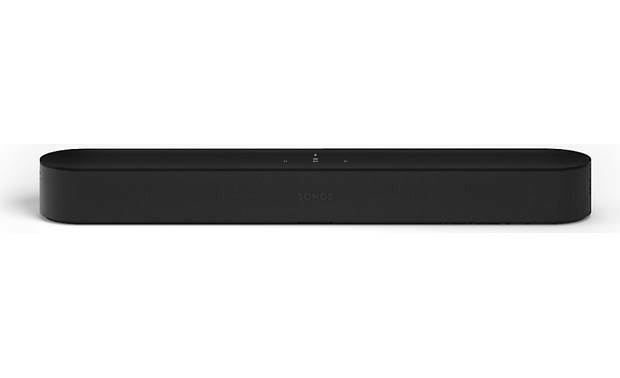 Searches related to the Sonos Beam TV sound bar/wireless music system with Amazon Alexa and Apple® AirPlay® 2.